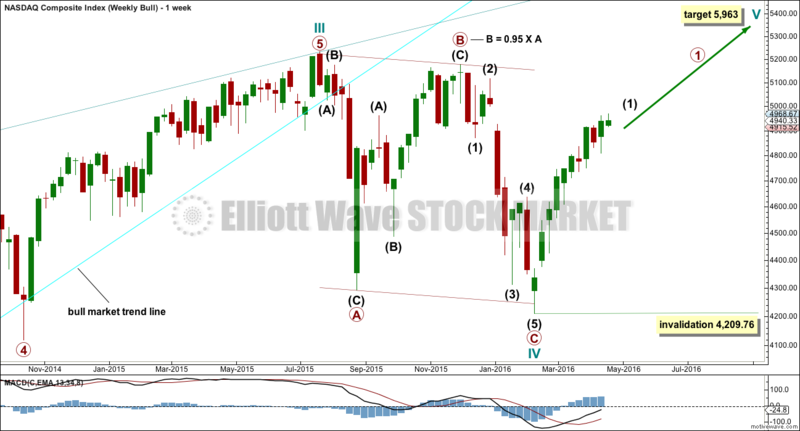 Updated Elliott wave and Technical analysis of Nasdaq. 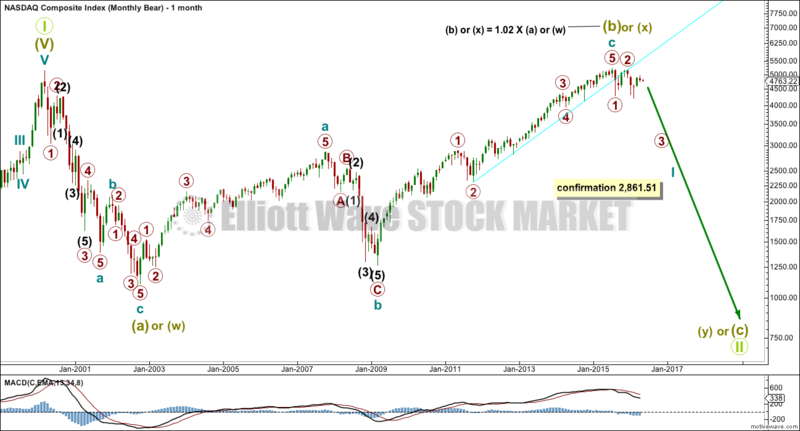 Elliott wave charts of bear wave count. Charts only today for members only. Last Nasdaq analysis expected upwards movement to end at resistance at the bear market trend line. Price has turned short of the line. Summary: Nasdaq has had a trend change. The target for a third wave down is 3,227. It may be met in about another ten weeks. Grand Super Cycle wave II may be an incomplete flat, combination or double flat. A new low below 2,861.51 would invalidate the bull wave count and confirm a huge market crash. All subdivisions are seen in exactly the same way, only the degree of labelling is different. If Grand Super Cycle wave II is a combination, then super cycle wave (y) would be a zigzag or triangle. 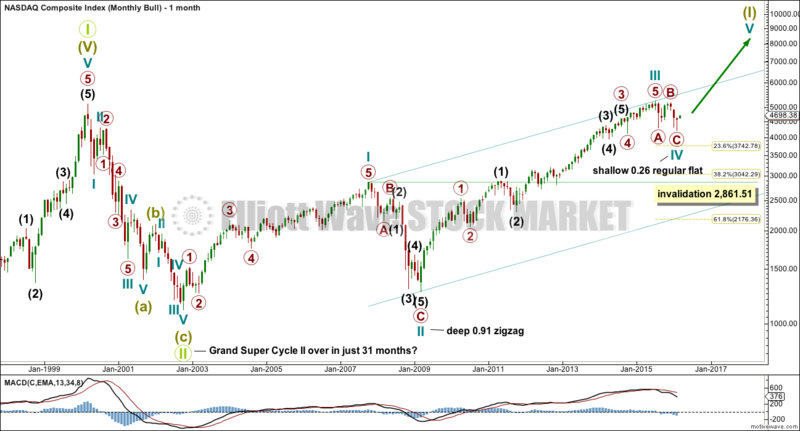 If Grand Super Cycle wave II is a double flat, then super cycle wave (y) would be a flat correction ending about the same level as super cycle wave (w) at 1,160. If Grand Super Cycle wave II is a regular flat, then super cycle wave (c) would be a five wave structure to end below super cycle wave (a) at 1,160 to avoid a truncation. The degree of labelling within downwards movement from the all time high only has been moved up one degree this week. 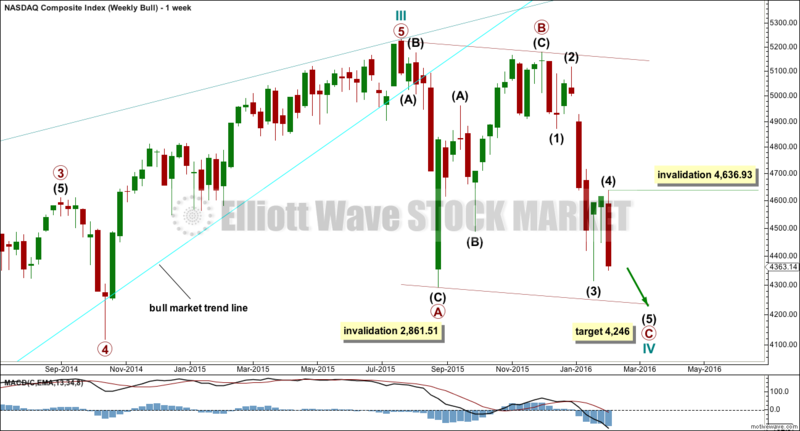 Downwards movement from the all time high may be a first wave for primary wave 1, a deep second wave correction for primary wave 2, and now an incomplete third wave for primary wave 3. 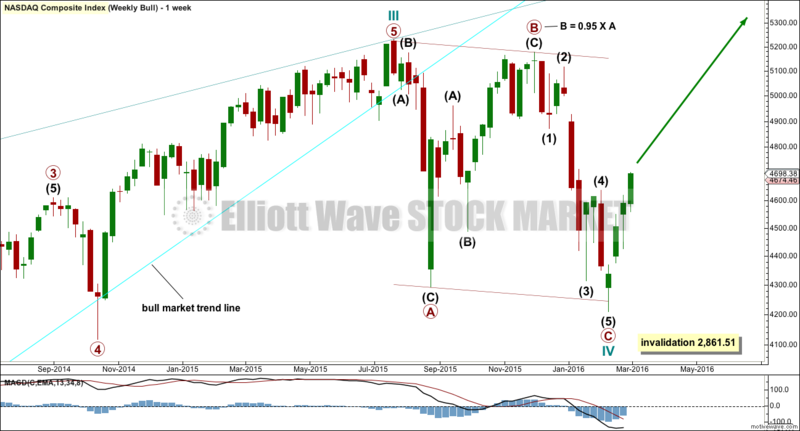 Primary wave 1 may have ended with a truncation. This is possible after the prior move of minor wave 3 moved “too far too fast”. Primary wave 3 must move far enough below the price extreme of primary wave 1 to allow for room for the following correction of primary wave 4 to unfold and not move back into primary wave 1 price territory. So far within primary wave 3 intermediates (1) and (2) are complete. A third wave at two large degrees may be just beginning. The prior bull market trend line was breached by a close (on a daily basis) by more than 3% of market value on 24th August 2015. This indicated the market had changed from bull to bear. The same technique will be used again, in the opposite direction. A bear market trend line is drawn from the all time high to the first major swing high within the bear market labelled intermediate wave (2). The bear market should be expected to remain intact while price remains below this trend line. When this trend line is breached by a close (on a daily basis) of 3% or more of market value, then it would be indicating a trend change from bear to bull. The channel about intermediate wave (2) has been clearly breached by downwards movement. Price fell short of the bear market trend line. Minor wave 1 may be incomplete. When it is done, a bounce for minor wave 2 may last a few days and would still most likely correct to the 0.618 Fibonacci ratio of minor wave 1. The small cyan trend channel is a best fit about this downwards movement. When it is clearly breached by upwards movement, then minor wave 2 would most likely have started. Minor wave 2 may not move beyond the start of minor wave 1 above 4,969.32. 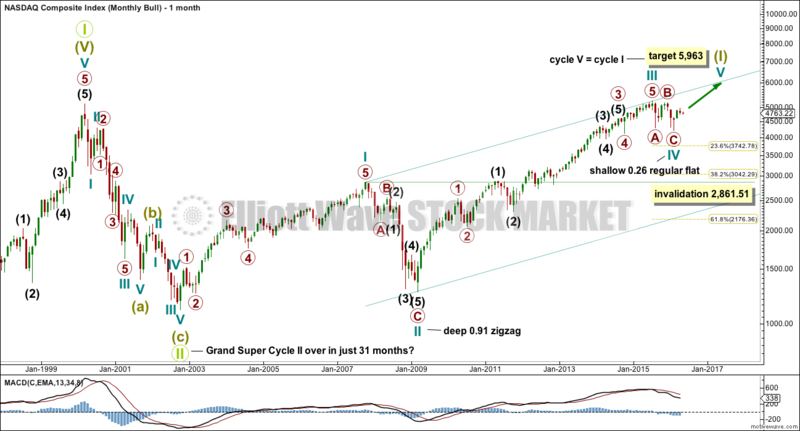 Grand Super Cycle wave II is seen here as over in just 31 months. This is possible, but it is more likely it would last longer than this. 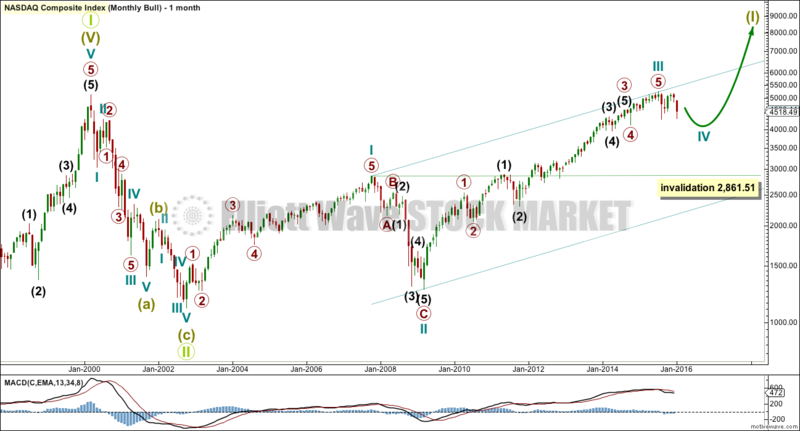 This wave count sees Nasdaq in a Grand Super Cycle wave III upwards. There is no Fibonacci ratio between cycle waves I and III. Super Cycle wave (I) is an incomplete impulse. Within Super Cycle wave (I), cycle wave IV may be complete. Cycle wave II was a very deep 0.91 zigzag lasting 17 months. Cycle wave IV may have exhibited alternation as a shallow flat lasting just 7 months. This is possible, but what is equally as possible is cycle wave IV may continue sideways as a double flat or double combination. Only a clear five up on the daily chart would eliminate these possibilities. 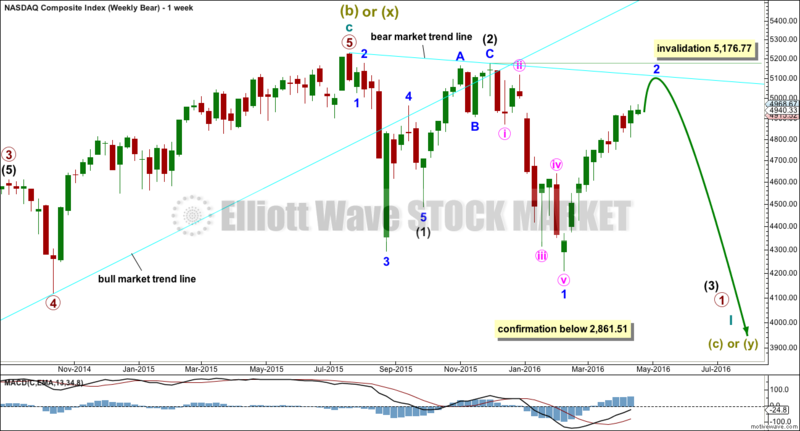 A trend change at cycle degree requires confirmation with a new high above 5,176.77 (to invalidate the bear count) and a five wave structure upwards on the daily chart. 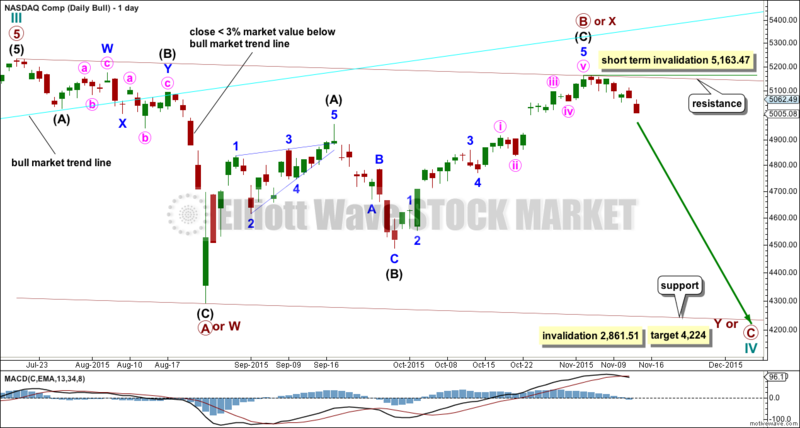 Cycle wave IV may not move into cycle wave I price territory below 2,861.51. Cycle wave IV is most likely to be a flat, combination or triangle to exhibit structural alternation with the zigzag of cycle wave II. Regular flats fit well within trend channels. Their C waves normally are about even in length with their A waves. Primary wave C is just 35.97 points longer than equality in length with primary wave A. The degree of labelling within cycle wave IV may be moved down one degree. This flat correction may be only primary wave A of a larger flat, or a triangle, or primary wave W of a double flat or double combination. A clear five wave structure upwards on the daily chart is absolutely required before any confidence may be had in this wave count. Unfortunately, the upwards wave which has recently ended is not clear. It would subdivide both as a zigzag and an impulse. As it is impossible to determine with certainty which one it is, both possibilities must be considered. This wave count is still technically valid. A more conservatively drawn trend line from the end of March 2009 is drawn here (blue line). It was reasonably shallow, repeatedly tested, and is highly technically significant. It has been breached and provided resistance. Since May 2010, overall, as price rose to all time highs volume declined. The bull market was not well supported by volume and is suspicious. 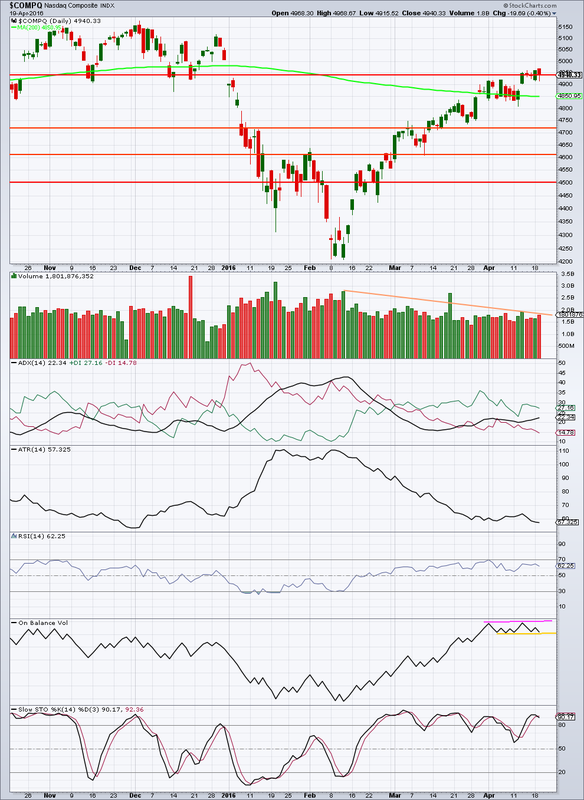 There was slight negative technical divergence with price and MACD at the all time high. As price has fallen four out of five months from the all time high it comes with overall declining volume. The fall in price is not being supported by volume for Nasdaq. This is not necessarily suspicious as the market can fall of its own weight. 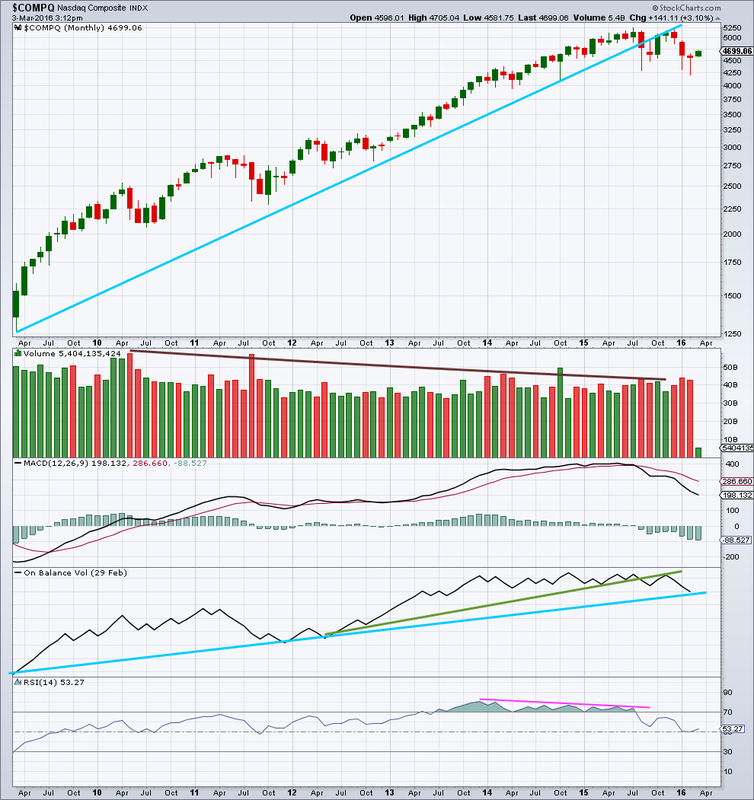 On Balance Volume has breached a trend line held since May 2012, (green line) which is bearish. OBV turned up and tested the green line which held. The strength of that line is reinforced. This is further bearish indication. The blue line is redrawn this week. OBV should find support at the blue line, which may initiate a bounce. There is negative divergence between price and RSI going back to December 2013, as price made all time highs. This is a strong bearish indicator. This was also seen up to March 2000, and was followed by a 78% drop in market value to the low of 1,108 in October 2012. 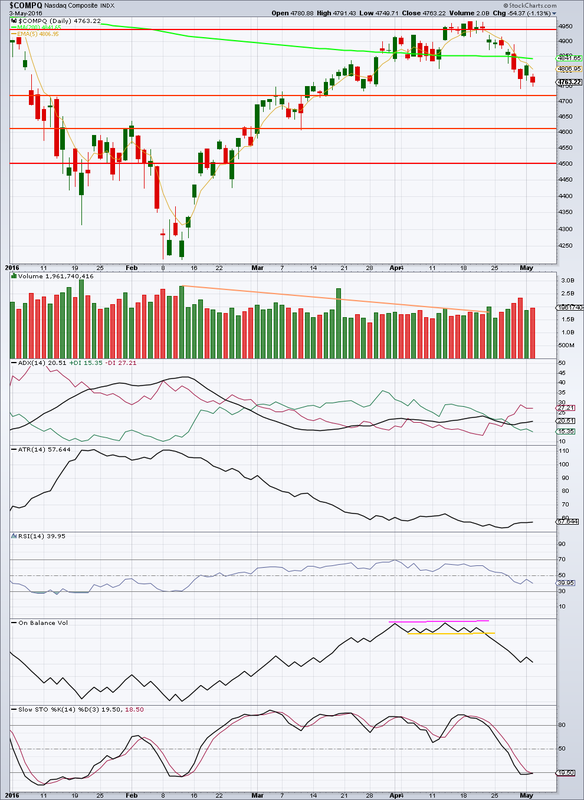 It does not mean that the market must make a similar fall at this time, but it is a strong bearish indicator. 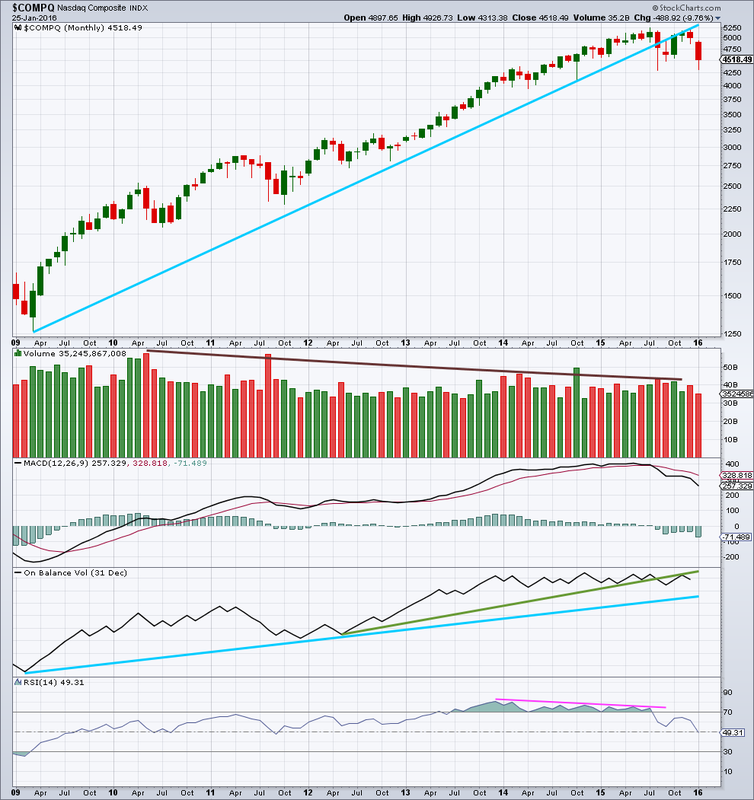 Nasdaq is in a bear market until proven otherwise. 1. The 200 day moving average is flat to declining. 2. Price has breached a bull market trend line. 3. Price remains below a bear market trend line. 4. From the all time high, price has made a series of lower lows and lower highs. 5. Bear market rallies from the all time high have been very deep and fully retraced. Even if one of these five conditions is broken, that would not alone be enough to confirm an end to the bear market and a new bull market. The one thing which would fully and finally confirm a new bull market would be a new all time high. Prior to that a balance of these conditions being broken would strongly indicate a new bull market. It should always be assumed that the trend remains the same, until proven otherwise. The bear market rally came with declining volume. The rise in price was not supported by volume and so was suspicious. Now price is falling on increasing volume. This supports a trend change and more downwards movement. ADX indicates there is currently a new downwards trend. It is increasing and the +DX line is above the -DX line. ATR is now beginning to increase after a long period of declining. ATR agrees with ADX; the market is trending downwards. On Balance Volume is moving lower with price. There is no support line that has been found at the daily chart level for OBV. 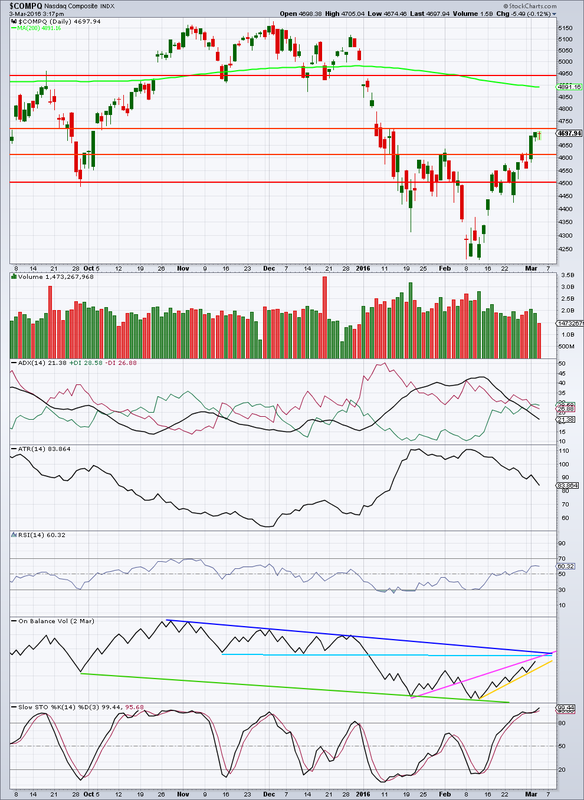 RSI is not yet extreme. There is room for price to fall. Stochastics is now entering oversold, but this oscillator may remain extreme for reasonable periods of time during a trending market. Its best use is for divergence to indicate trend weakness. While I have found a Fibonacci 13 day moving average useful for support during recent upwards waves, a shorter Fibonacci 5 day moving average better shows support for the faster downwards waves. It may be useful here again. This analysis is published @ 04:48 a.m. EST. Last Nasdaq analysis expected upwards movement to end about 4,784. This has not happened. Price continues to move upwards. Summary: Nasdaq is still in a bear market, until proven otherwise. A big third wave down is close. If this current bounce continues, it may end when price finds resistance at the bear market trend line. 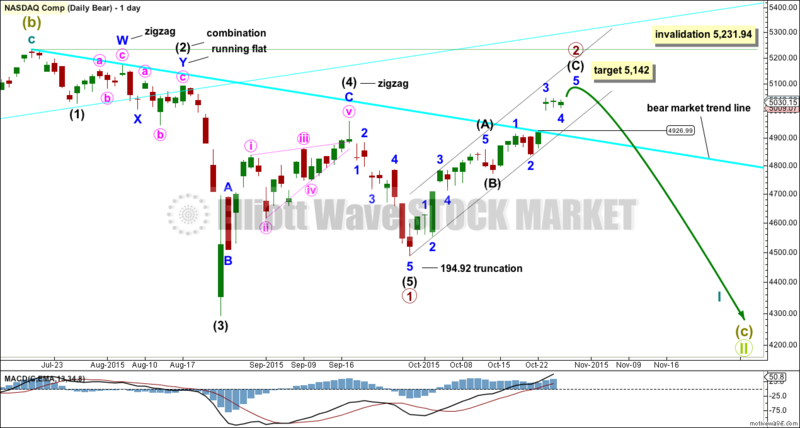 Downwards movement from the all time high may be a first wave for intermediate wave (1), a deep second wave correction for intermediate wave (2), and now an incomplete third wave for intermediate wave (3). Intermediate wave (1) may have ended with a truncation. This is possible after the prior move of minor wave 3 moved “too far too fast”. With intermediate wave (1) seen as over with a truncation, the structure of intermediate wave (2) now fits as a zigzag. It looks like a three. Intermediate wave (3) must move far enough below the price extreme of intermediate wave (1) to allow for room for the following correction of intermediate wave (4) to unfold and not move back into intermediate wave (1) price territory. This technique is outlined by Magee in the classic “Technical Analysis of Stock Trends”. It is simple and simple is best. 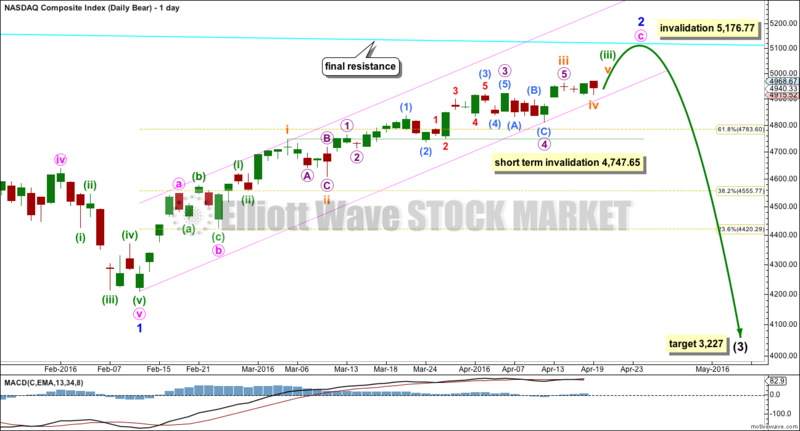 Within intermediate wave (3), an impulse is complete for minor wave 1. Minor wave 2 may be a zigzag. It may end when price finds resistance at the bear market trend line. The pink channel is a best fit about this upwards movement. When it is clearly breached by downwards movement, that shall be early indication of a trend change. Within minor wave 2, the correction for subminuette wave iv may not move into subminuette wave i price territory below 4,747.65. A third wave within a third wave down would be expected for this wave count when minor wave 2 is over. 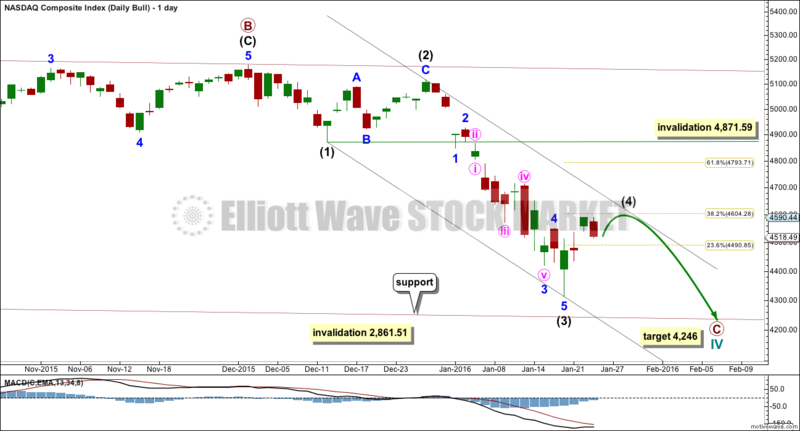 At 3,227 intermediate wave (3) would reach 2.618 the length of intermediate wave (1). Minor wave 2 may not move beyond the start of minor wave 1 above 5,176.77. The degree of labelling within cycle wave IV may be moved down one degree. This flat correction may be only primary wave A of a larger flat, or a triangle, or primary wave W of a double flat or double combination. 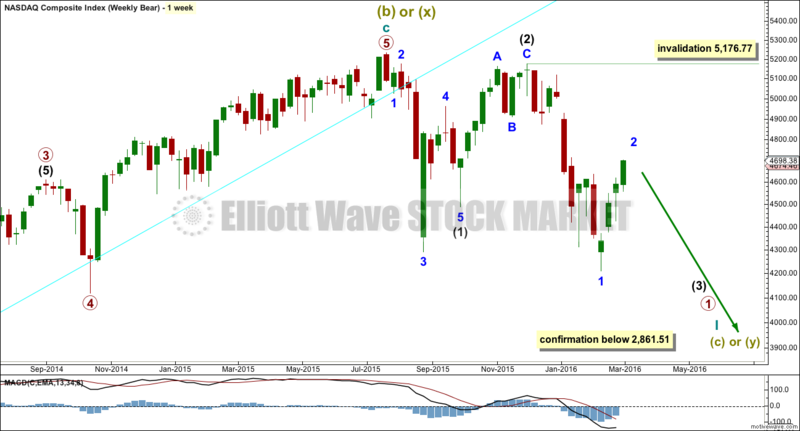 A clear five wave structure upwards on the daily chart is absolutely required before any confidence may be had in this wave count. A new cycle degree bull market should last one to several years. Waiting for confirmation is a wise idea. 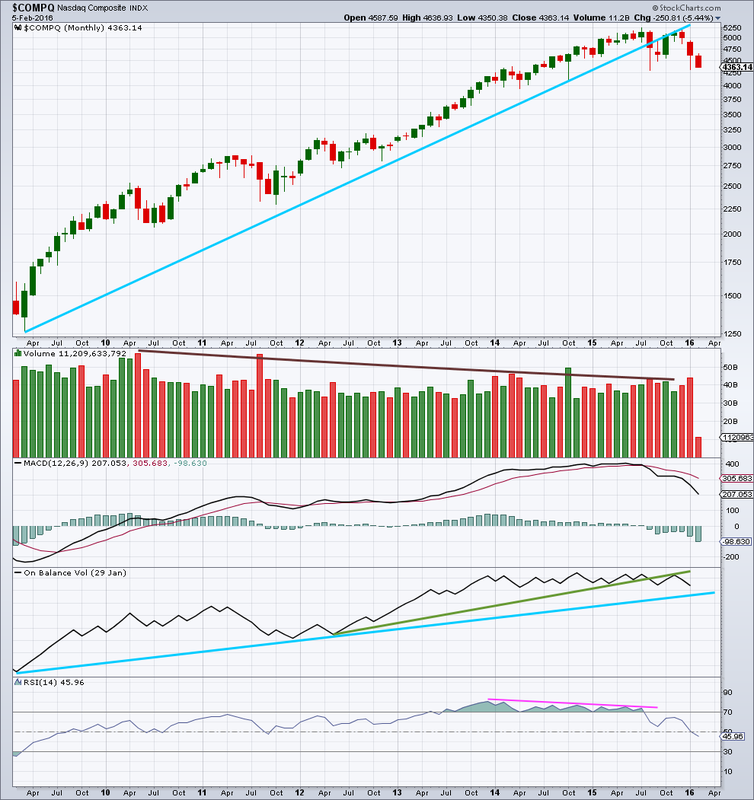 On Balance Volume has breached a trend line held since May 2012, (green line) which is bearish. OBV turned up and tested the green line which held. The strength of that line is reinforced. This is further bearish indication. OBV has found support at the blue line. A breach of this blue line would be very strong bearish indication. This line is highly technically significant because it is long held and tested three times at the monthly chart level. As price moves higher for several weeks now in a bear market rally, it comes on overall declining volume. The rise in price is not supported by volume and is unsustainable. ADX indicates there is currently an upwards trend. ATR disagrees. ATR declining is more normal for a consolidating market than a trending market. This upwards trend is not normal; it comes with a decline in range. This indicates weakness in the trend. On Balance Volume is currently constrained within two trend lines. A break above the pink trend line would be a short term bullish signal. A break below the yellow line would be a short term bearish signal. 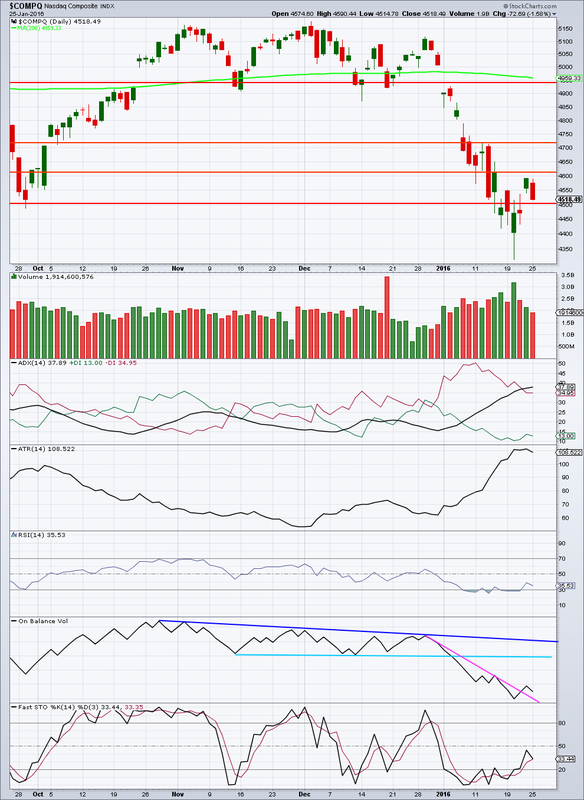 RSI exhibits divergence between price at the current high and the highs a few days ago of 1st April. This indicates that upwards movement from price is weak. Stochastics exhibits divergence between price at the current high and the high of 3rd March. This also indicates upwards movement from price is weak. On balance, there is enough weakness from price to judge that this upwards movement is more likely a bear market rally than a new bull market. This upwards movement should be expected to be fully retraced. This analysis is published @ 05:07 a.m. EST on 20th April, 2016. Last Nasdaq analysis was invalidated by upwards movement. Summary: Nasdaq is still in a bear market. A big third wave down is very close. If this current bounce continues, it may end about 4,784. Super Cycle wave (I) is an incomplete impulse. Within Super Cycle wave (I), cycle wave IV is just now complete. 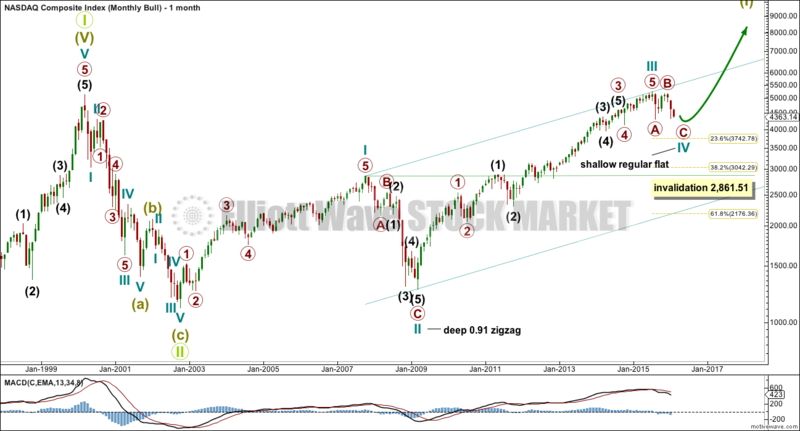 Cycle wave II was a very deep 0.91 zigzag lasting 17 months. Cycle wave IV may have exhibited alternation as a shallow flat lasting just 7 months. This is possible, but what is equally as possible is cycle wave IV may continue sideways as a double flat or double combination. Only a clear five up on the daily chart would eliminate these possibilities. A trend change at cycle degree requires confirmation with a new high above 5,176.77 (to invalidate the bear count below) and a clear five wave structure upwards on the daily chart. 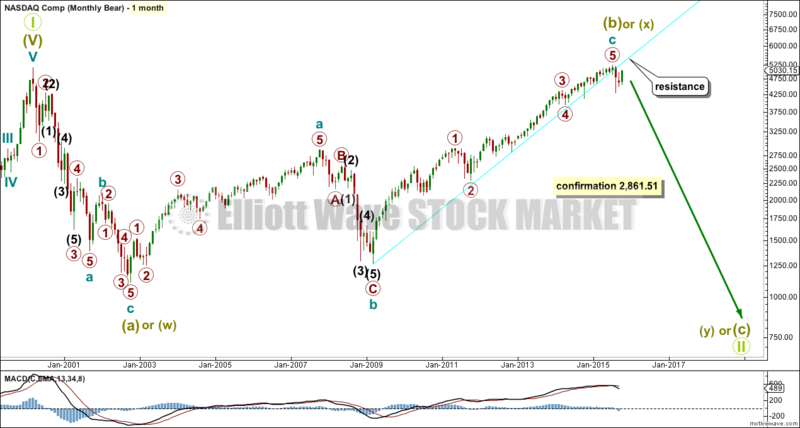 The bull market trend line is drawn from the end of cycle wave II in March 2009, to the end of minuette wave (ii) in November 2012. This trend line has been breached by a close of more than 3% of market value indicating a market change from bull to bear. Regular flats fit well within trend channels. Their C waves normally are about even in length with their A waves. At 4,246 primary wave C would reach equality in length with primary wave A. 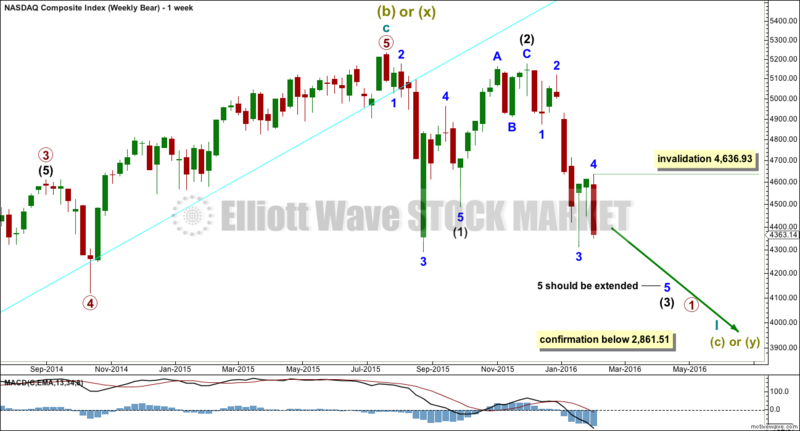 Primary wave C may find support at the lower edge of the channel. Primary wave C is just 35.97 points longer than equality in length with primary wave A. The bear wave count just moves everything from the all time high at 5,132.52 all down one degree. Grand Super Cycle wave II may be an incomplete flat, combination or double flat. The labelling of this upwards impulse is exactly the same as the bull wave count at the weekly chart level because 1-2-3 of an impulse subdivides 5-3-5, exactly the same as a zigzag. Here the bull market from March 2009 is seen as a zigzag for a super cycle wave (b). Super cycle wave (b) was a 101% length of super cycle wave (a). Downwards movement for both bull and bear wave counts is seen in the same way as a five wave impulse. C waves and third waves will both subdivide as impulses. Third waves may only subdivide as impulses. 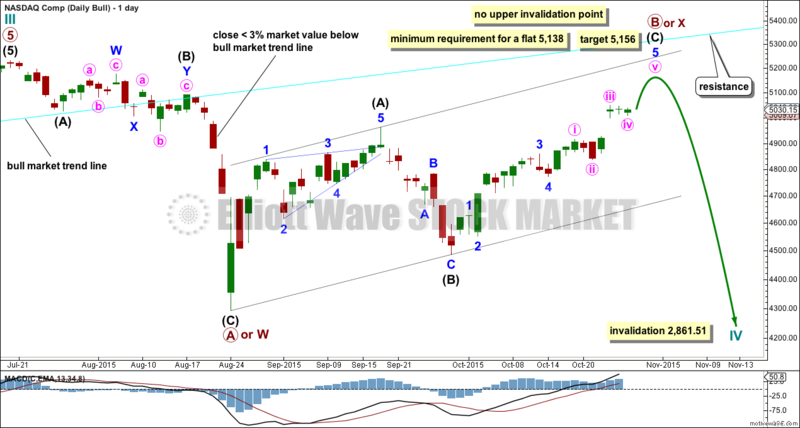 Within intermediate wave (3), an impulse is complete for minor wave 1. This cannot be the entirety of intermediate wave (3) because it has not moved far enough below the price territory of intermediate wave (1). Minor wave 2 may be a complete or almost complete double zigzag. If it continues higher, it may end about the .618 Fibonacci ratio at 4,784. Minor wave 2 fits neatly into a small channel. When this channel is clearly breached by a full daily candlestick below and not touching the lower edge, that shall provide trend channel confirmation that the bounce of minor wave 2 is over and the next wave down is underway. At 3,972 intermediate wave (3) would reach 1.618 the length of intermediate wave (1). If this target is wrong, it may not be low enough. The next target would be at 3,227 where intermediate wave (3) would reach 2.618 the length of intermediate wave (1). On Balance Volume has breached a trend line held since May 2012, (green line) which is bearish. OBV turned up and tested the green line which held. The strength of that line is reinforced. This is further bearish indication. For three days in a row now, as price rises there is declining volume. The upwards move in price is weak and not supported by volume, so is suspicious. This looks like a typical bear market rally and not the start of a new bull market. ADX is declining which indicates the market is not trending; it is consolidating. ATR agrees as it too is declining. Price is finding resistance just below the red horizontal trend line at 4,120. This bounce has returned RSI from almost oversold to above neutral. There is again plenty of room for this bear market to fall. On Balance Volume is finding resistance at three trend lines (almost). Any further upwards movement from OBV should be stopped by these three lines. A new yellow line is drawn for support. If that line is breached by OBV, it would be a bearish indication. Stochastics is overbought. With price finding resistance and Stochastics overbought, an end to the upwards swing should be expected about here. This analysis is published @ 04:32 p.m. EST. 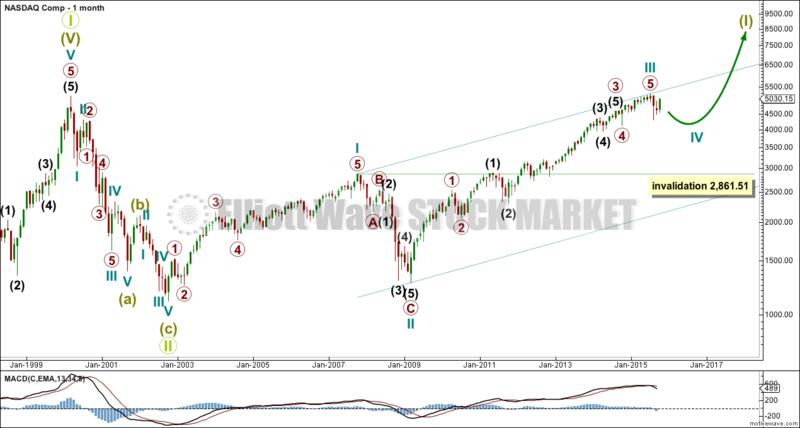 Last Nasdaq analysis expected some upwards movement to about 4,604, then more downwards movement. So far that is somewhat close to what has happened. Price moved up to reach 4,636.93 and has turned down from there. Summary: Nasdaq should continue lower. The target for the preferred bear wave count is 4,205 for a short term interruption to the trend, and at 3,972 for the mid term. Look out for surprises to the downside. Momentum should increase. Super Cycle wave (I) is an incomplete impulse. Within Super Cycle wave (I), cycle wave IV is underway. Cycle wave II was a very deep 0.91 zigzag lasting 17 months. Cycle wave IV should exhibit alternation, so is most likely to be a flat, combination or triangle. 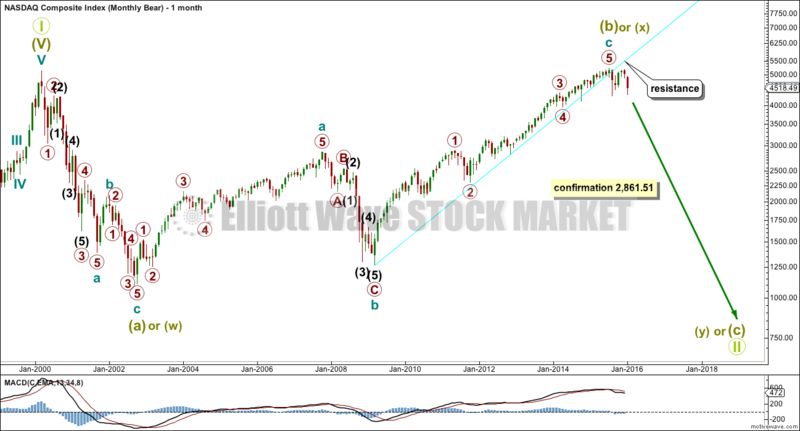 These are more time consuming structures than zigzags, so cycle wave IV should last at least 18 months and may last a total Fibonacci 21 or more likely 34 months. So far it is in just its seventh month. The degree of labelling within it at the weekly and daily chart level may need to be moved down one degree. Cycle wave IV may end about either the 0.236 or 0.382 Fibonacci ratios of cycle wave III at 3,748 or 3,042. Cycle wave IV is most likely to be a flat, combination or triangle to exhibit structural alternation with the zigzag of cycle wave II. So far the first wave down may be a zigzag for primary wave A. This may also be a zigzag for primary wave W of a combination. Primary wave B is over 90% the length of primary wave A. This may be a regular flat correction. Regular flats fit well within trend channels. Their C waves normally are about even in length with their A waves. At 4,246 primary wave C would reach equality in length with primary wave A. 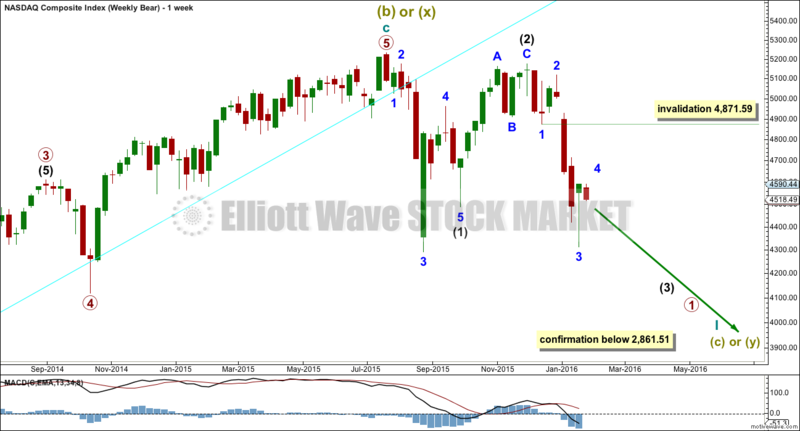 Primary wave C may find support at the lower edge of the channel. When a possible regular flat is complete, depending on the complete duration of the structure, then the degree of labelling within cycle wave IV may be moved down one degree. This flat correction may be only primary wave A of a larger flat, or a triangle, or primary wave W of a double flat or double combination. A judgement based upon the overall look at the monthly chart level would be made at that stage. For now I will leave the labelling as it is. Cycle wave IV would most likely be a flat correction, or at least the first structure within it would most likely be a flat. Primary wave C must complete as a five wave structure. Intermediate wave (4) now looks to be complete. It lasted a Fibonacci 8 days. 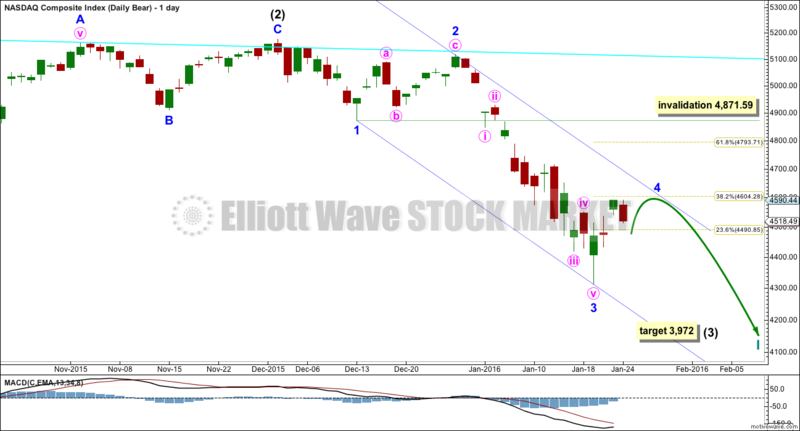 Within intermediate wave (5), no second wave correction may move beyond its start above 4,636.93. 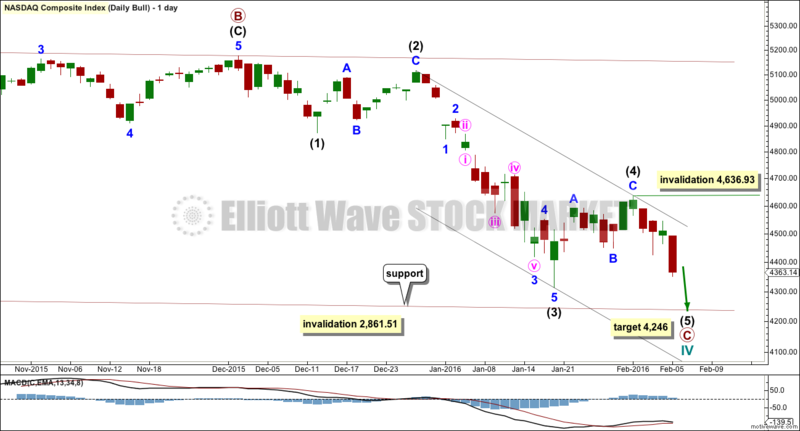 At 3,972 intermediate wave (3) would reach 1.618 the length of intermediate wave (1). This target expects that minor wave 5 will be extended. Minor wave 4 should now be complete. Within minor wave 5 minute, wave ii shows up on the daily chart, and this indicates that minor wave 5 is unfolding as an extended impulse. At 4,205 minute wave iii would reach 1.618 the length of minute wave i. Within minor wave 5, minute wave ii may not move beyond the start of minute wave i above 4,545.52. Apart from strong volume for the upwards day of 29th January the volume profile continues to be bearish. Last week as price fell volume increased and as price moved higher volume declined. Friday’s strong downwards movement in price was supported by an increase in volume. ADX indicates there is a clear trend and it is down. At the end of the week, ATR may be beginning to agree. It is starting to increase. 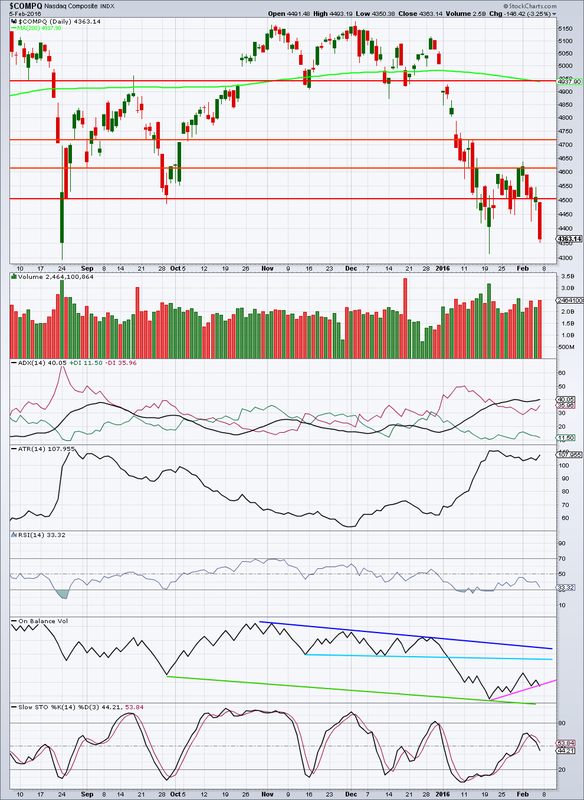 RSI is not yet oversold. There is room for price to fall. On Balance Volume looks like it may be breaking below another trend line, a further bearish indication. The next support line I can find so far for OBV is some distance away (green line). Stochastics is neutral, so it does not indicate an end to this downwards movement. It can remain extreme for some time during a trend, I will look for divergence between price and Stochastics to indicate a correction. Last Nasdaq analysis expected downwards movement which is exactly what has happened. Cycle wave II was a very deep 0.91 zigzag lasting 17 months. Cycle wave IV should exhibit alternation, so is most likely to be a flat, combination or triangle. These are more time consuming structures than zigzags, so cycle wave IV should last at least 18 months and may last a total Fibonacci 21 or more likely 34 months. So far it is in just its sixth month. The degree of labelling within it at the weekly and daily chart level may need to be moved down one degree. Primary wave C must complete as a five wave structure. So far intermediate wave (4) is probably incomplete. It may end close to the 0.382 Fibonacci ratio at 4,604. 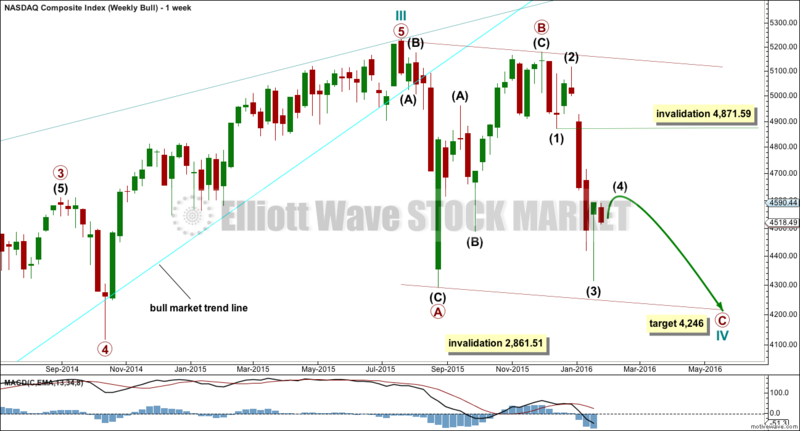 It may find resistance at the upper edge of the channel drawn about primary wave C.
Intermediate wave (2) was a deep 0.8 zigzag lasting 10 days. Intermediate wave (4) would most likely be a shallow flat, combination or triangle. It may last a little longer than 10 days as these kind of structures tend to be more time consuming than quicker zigzags. 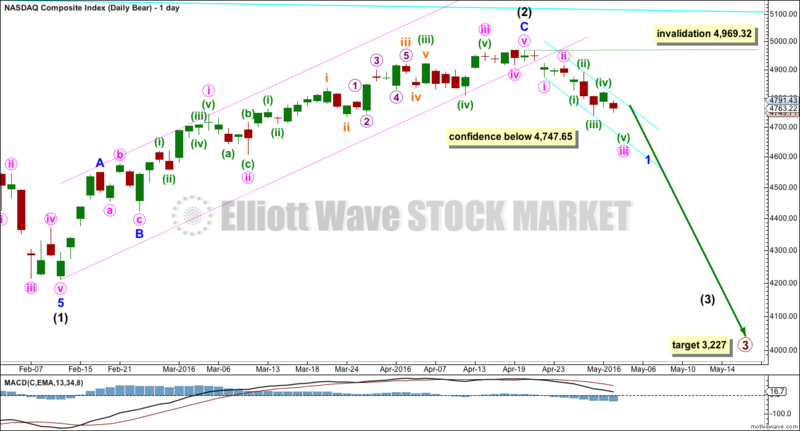 Intermediate wave (4) may not move into intermediate wave (1) price territory above 4,871.49. With intermediate wave (1) seen as over with a truncation, the structure of intermediate wave (2) now fits better as a zigzag. It looks like a three. Minor wave 4 may not move into minor wave 1 price territory above 4,871.59. If this invalidation point is breached, then upwards movement may be another second wave correction within minor wave 3. The invalidation point for that idea is at 5,116.99. Price came with increasing volume as it fell to the last low. The fall in price is supported by volume. The volume profile is bearish. Price comes with declining volume as it has overall moved higher over the last four days. ADX is delayed. It is still indicating price is trending and the trend is down. ATR today disagrees as it is declining indicating the market is consolidating. Importantly, ADX has not indicated a trend change from down to up: the -DX line remains above the +DX line. The correction is resolving RSI oversold. It is returning towards neutral. On Balance Volume may find resistance at the blue trend lines. The correction in price may end when price finds resistance and Stochastics reaches overbought at the same time. The first line of resistance for price is about 4,613. Thereafter, the next line of resistance is about 4,720. This analysis is published @ 02:35 a.m. EST on 26th January, 2016. Last Nasdaq analysis expected upwards movement to either 5,142 or 5,156. Price moved higher to reach 5,163 and has since turned down. To see monthly and weekly charts for bull and bear click here. The bull market trend line was breached by a close more than 3% of value below it on 20th August. There is a 5-3-5 complete thus far to the downside. 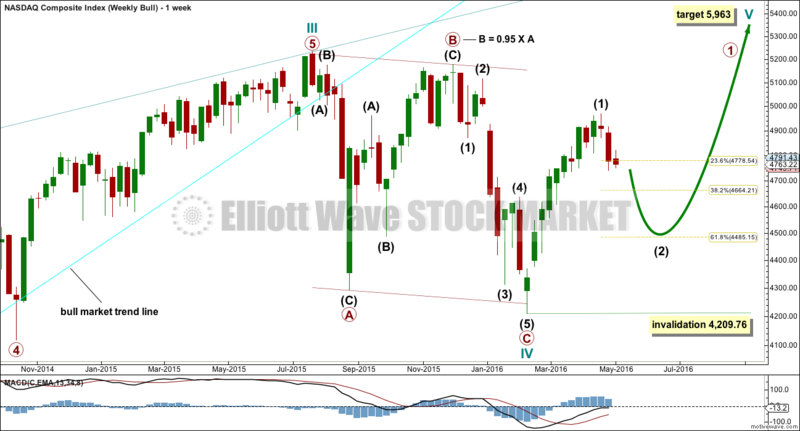 This may be a three wave structure for a primary degree A or W wave for this more bullish wave count (more bullish than the very bearish wave count below). Cycle wave IV is most likely to be a flat, combination or triangle to exhibit alternation with the zigzag of cycle wave II. If cycle wave IV is a flat correction, then primary wave A may be a complete three. Primary wave B is 0.93 the length of primary wave A, more than the minimum requirement for a flat at 0.9. This may be a regular flat. Primary wave C would reach equality in length with primary wave A at 4,224. If cycle wave IV is a combination, then the first structure is a completed zigzag which would be labelled primary wave W. The double would now be joined by a complete three in the opposite direction, a zigzag labelled primary wave X. Primary wave Y may be a flat which needs to begin with a clear five down for a movement at primary degree. The second structure in a double combination for primary wave Y would be expected to end about the same level as the first, about 4,292 so that the whole thing moves sideways. If cycle wave IV is a triangle, then primary wave A would be a complete zigzag. Primary wave B would now also be a complete zigzag. Primary wave C for a triangle may not move beyond the end of primary wave A at 4,292.14. A triangle could take several months to unfold as price moves sideways in an ever decreasing range. At this stage, a short term upper invalidation point would be at 5,163.47. If primary wave C or Y has begun, then within the first five down no second wave correction may move beyond its start. 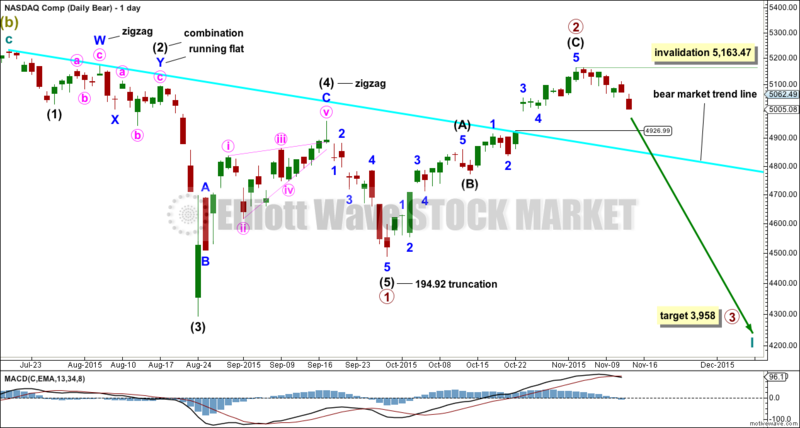 There may now be either a complete five down with a severely truncated fifth wave as labelled, or there may be a complete three down for a first wave of a leading diagonal. The structure of the next wave down and then the depth of the following upwards correction would indicate if an impulse or a leading diagonal is unfolding. If the next wave down is a zigzag, then a leading diagonal would be unfolding. If the next wave down is an impulse, then it would be more likely a larger impulse would be unfolding. If the following correction moves above 4,292.14, then it would overlap back into a first wave of a leading diagonal, and a leading diagonal would be indicated. If it remains below 4,292.14, then an impulse would be indicated. Primary wave 2 should now be over as a deep zigzag. At 3,958 primary wave 3 would reach 1.618 the length of primary wave 1. 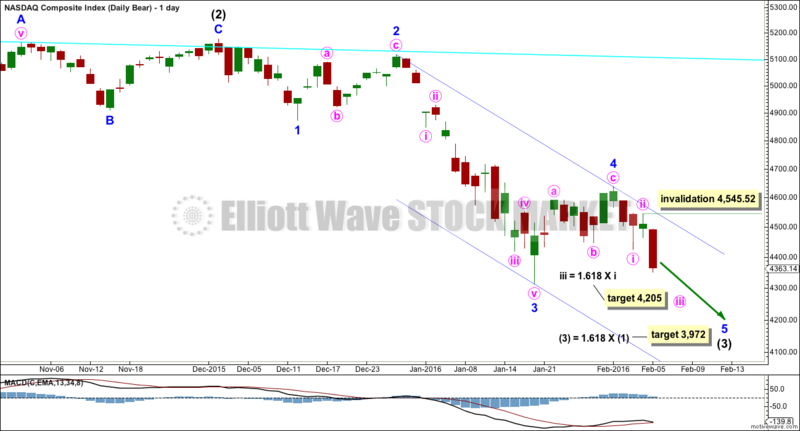 No second wave correction may move beyond its start above 5,163.47 within primary wave 3. The bear market trend line was breached by a close of more than 3% of market value. This is a warning that this bear wave count may be wrong. While none of the indices (S&P500, DJIA, DJT or Nasdaq) have made new all time highs though a bear market should be expected to remain intact. 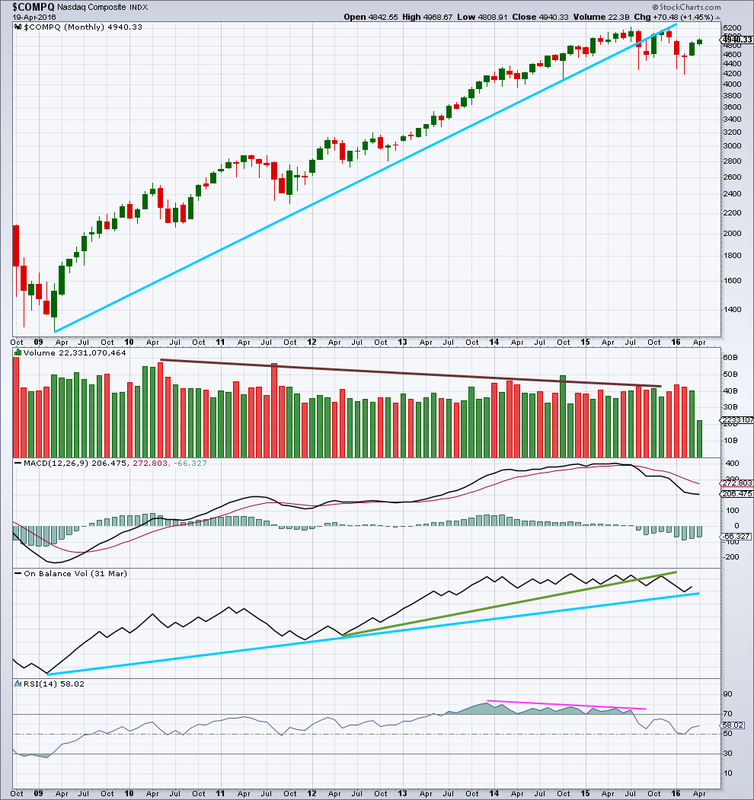 On Balance Volume has breached a trend line held since May 2012, (green line) which is bearish. OBV is turning up. If it finds resistance at the green line and does not break through, that would be further bearishness and the strength of that line would be reinforced. If OBV breaches the longer held blue line, that would be further and stronger bearish indication. Volume declined slightly while price has been rising overall for 25 days. The rise in price was not supported by volume and is suspicious. ADX is turning downwards indicating no trend currently. The -DX and +DX lines may be coming to cross. If they do, it would indicate a trend change. So far the fall in price of the last seven days comes on overall a decline in volume. Volume is not supporting price movement either way. Price may find some support here at the breakaway gap. If the gap is closed and price closes below the horizontal trend line, that would be a bearish indicator. If price bounces up from here to new highs, then it would be a strong bullish indicator. On Balance Volume is a good leading indicator and works well with trend lines. 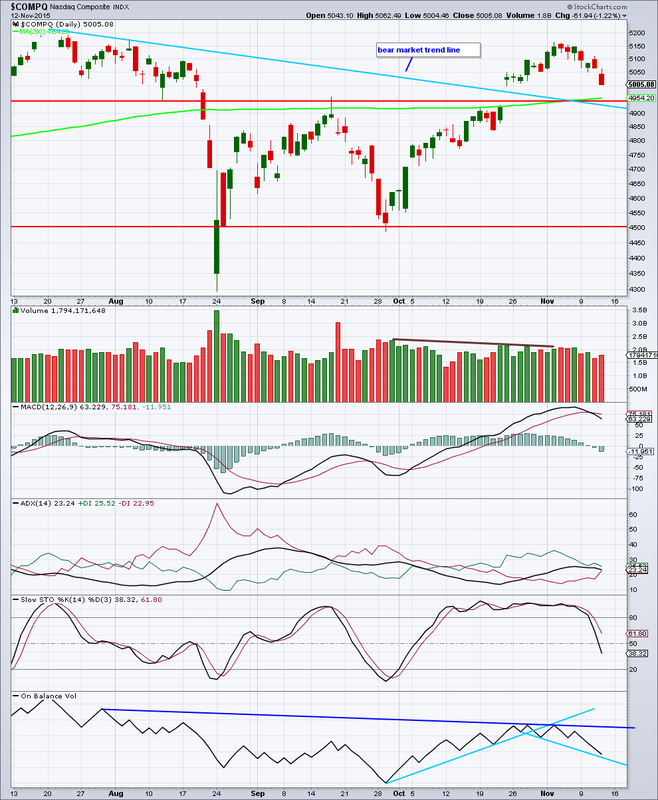 It has breached the upwards sloping blue line, a bearish indicator, three days before price found the last high. OBV has come to touch a short held downwards sloping line. If this is breached, it would be further bearishness. If OBV bounces up from here, it would reinforce the strength of that line. OBV needs to break above the dark blue line for it to provide a bullish indication. Nasdaq has breached its bull market trend line by a close of more than 3% of market value. I have two Elliott wave counts today. The first is bullish, still at super cycle degree. 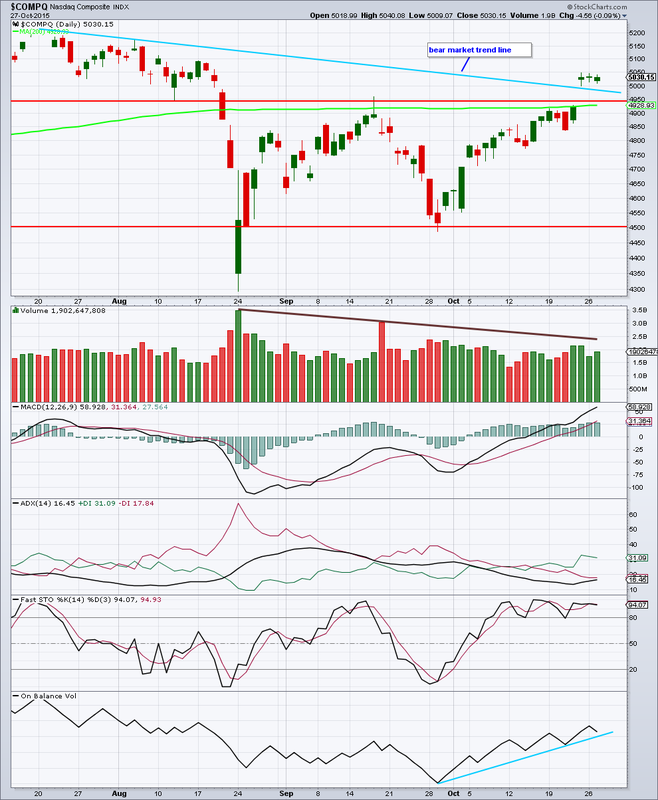 The second expects Nasdaq is in the early stages of a huge market crash. 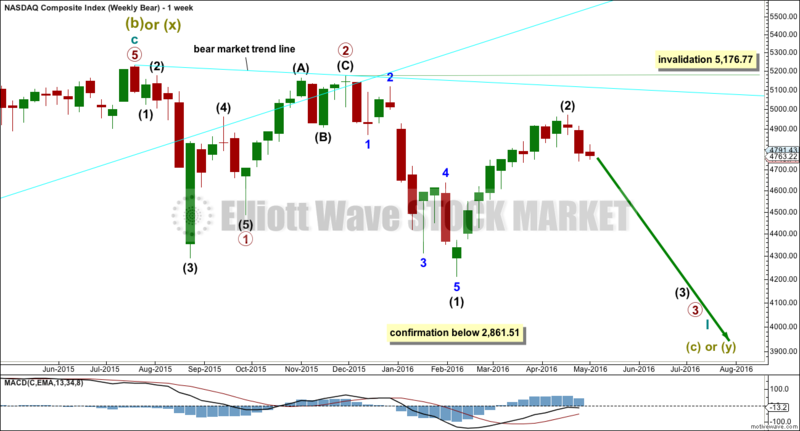 To see detail of weekly charts which shows subdivisions of cycle wave III (bull) or cycle wave c (bear) see last analysis here. There is no Fibonacci ratios between cycle waves I and III. Cycle wave II was a very deep 0.91 zigzag lasting 17 months. Cycle wave IV should exhibit alternation, so is most likely to be a flat, combination or triangle. These are more time consuming structures than zigzags, so cycle wave IV should last at least 18 months and may last a total Fibonacci 21 or more likely 34 months. If cycle wave IV is a flat correction, then primary wave A may be a complete three. Primary wave B must retrace a minimum 90% of primary wave A at 5,138. Primary wave B may make a new all time high above the start of primary wave A as in an expanded flat. Primary wave B must subdivide as a three. If cycle wave IV is a combination, then the first structure is a completed zigzag which would be labelled primary wave W. The double should be joined by a three in the opposite correction labelled primary wave X. Primary wave X may be any corrective structure, has no minimum requirement, and may make a new high above the start of primary wave W.
If cycle wave IV is a triangle, then primary wave A would be a complete zigzag. Primary wave B must be a three wave structure and may make a new high above the start of primary wave A as in a running triangle. If a zigzag is unfolding upwards for primary wave B or W, then at 5,156 intermediate wave (C) would reach equality in length with intermediate wave (A). There is no upper invalidation point for any of these three most likely structures. At this stage, it is impossible to know which structure cycle wave IV may unfold as. 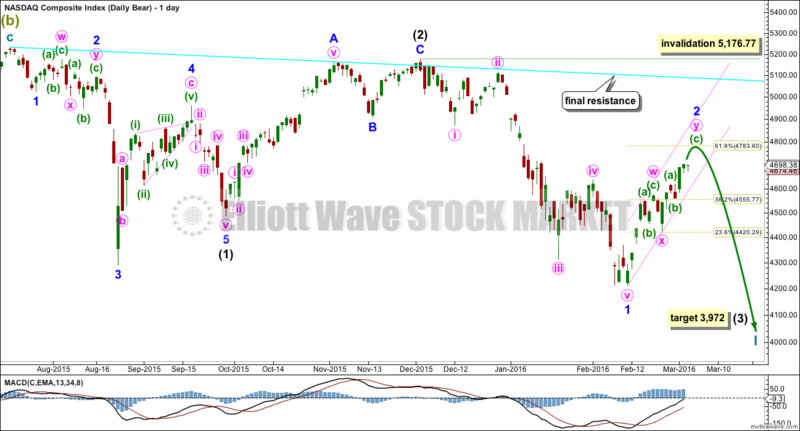 There may now be either a complete five down with a severely truncated fifth wave as labelled, or there may be a complete three down for a first wave of a leading diagonal. For both ideas the second wave may not move beyond the start of the first above 5,231.94. At 5,142 intermediate wave (C) would reach equality in length with intermediate wave (A). 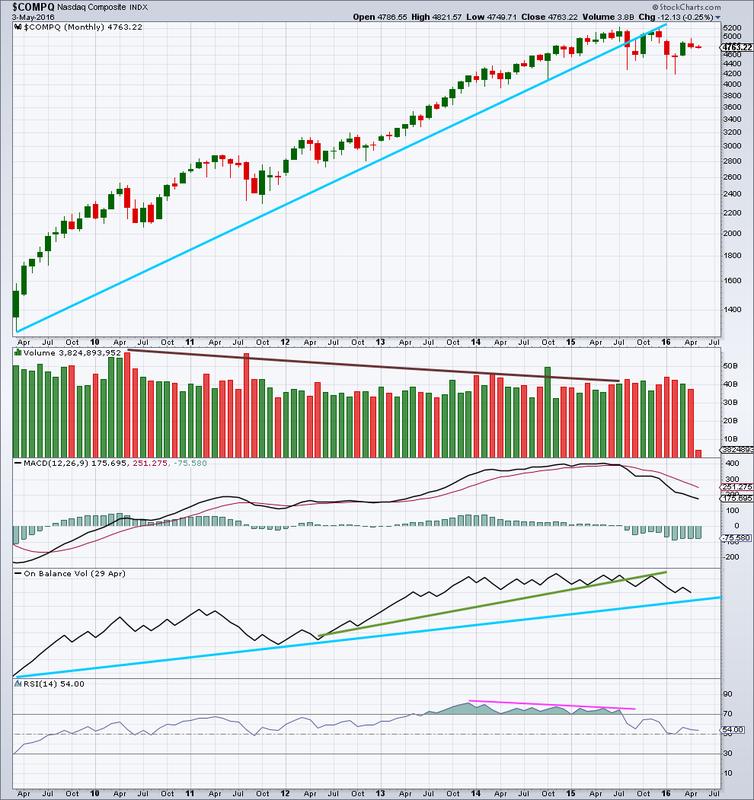 On Balance Volume has breached a trend line held since May 2012 (green line) which is bearish. If OBV breaches the longer held blue line that would be further and stronger bearish indication. The break above the upper horizontal trend line which previously provided resistance came with a breakaway gap and on an increase in upwards volume. This looks like Nasdaq has broken out of a consolidation zone to the upside. MACD shows an increase in upwards momentum. ADX is above 15 and rising, the +DX line is above the -DX line. This indicates potentially the start of a new upwards trend. On Balance Volume remains above the short blue trend line. So far all these indicators at the daily chart level are bullish. 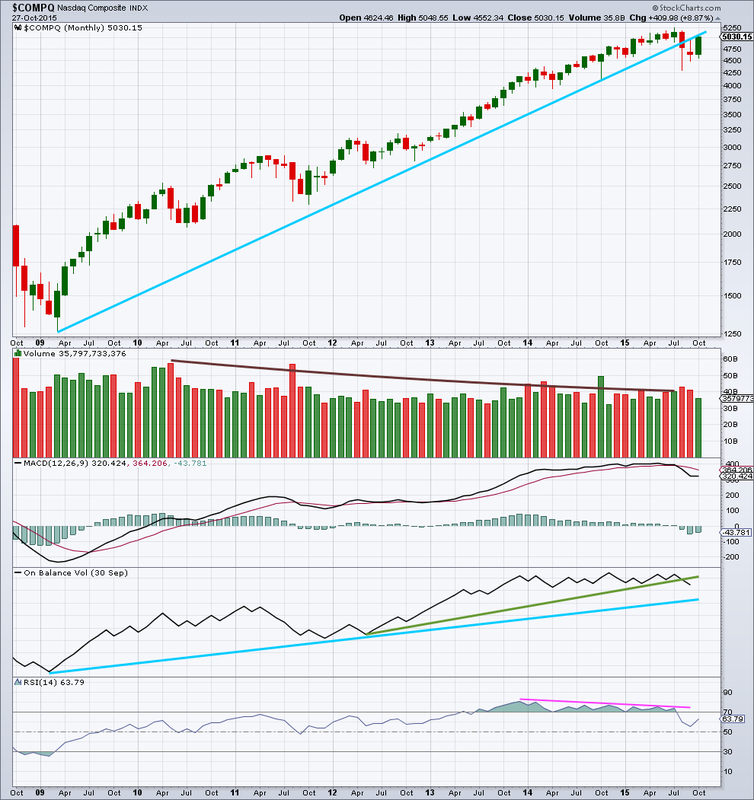 However, the picture at the monthly chart level remains very bearish. When Nasdaq breached its long held bull market trend line on 20th August that indicated a market switch from bull to bear. For confidence in a switch back to a bull market the same approach should be used. The bear market trend line drawn here (and on the bear daily chart) is drawn using the approach outlined by Magee in “Technical Analysis of Stock Trends”. When that line is breached by a close of 3% or more of market value then a market change from bear to bull would be indicated. So far that has not happened. Price needs to close at or above 5,075 to confirm a change back to a bull market. While that has not happened it should be assumed the trend remains the same, downwards. Stochastics shows some divergence as price made new highs Stochastics failed to confirm. This is a weak bearish signal.